Just how high can the cost of college go? Recently, there has been a lot of discussion on college affordability and multiple new policy proposals. 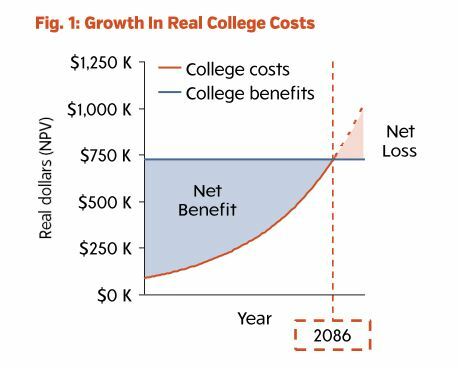 With college tuition on the rise, HPS wanted to investigate the actual value driving these increases and determine just how sustainable tuition increases are. The results in this study evaluate the real economic benefits of higher education in terms of higher lifetime earnings. Our goal was to determine how long higher education would remain a compelling investment should tuition continue to increase at the current rate. The present benefit of a bachelor’s degree over an associate’s degree is equal to approximately $340,000 in lifetime earnings.